Aquascape PRO Pond Pumps and waterfall pumps are ideal for use in skimmer filters and Pondless Waterfall applications. Known for their durability and performance, Aquascape PRO pond pumps’ heavy-duty construction provides strength and corrosion resistance, ensuring years of trouble-free use. AquascapePRO Pond Pumps provide high flow-rates and work efficiently in higher head height applications. Their rubber feet ensure quiet pump operation by reducing vibration. All AquascapePRO Pond Pumps carry a 2-Year Limited Warranty. 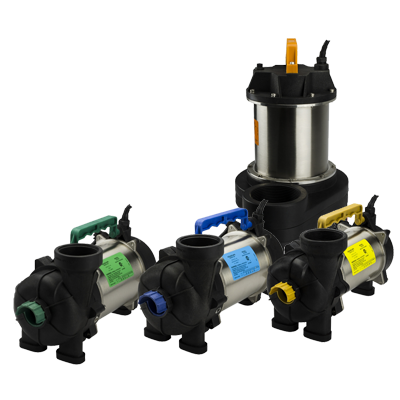 Once you’ve determined which Aquascape pump family best suits your water feature application, you’ll need to select the proper size pump. *Length, Width and Depth are measured in feet. We multiply by 0.8 to account for rocks in the pond. Most pond pumps are rated by the gallons of water they're able to pump per hour (GPH). As a general rule of thumb, a pump with a flow rate of 1500 GPH is needed for every foot of the length of the spillway (the weir, which is the horizontal width of the waterfall opening). 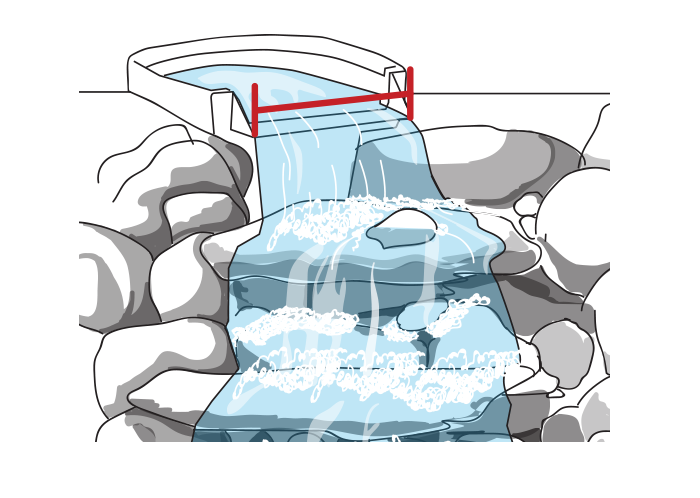 So if your waterfall spillway is two feet wide, you'll need a pump with a flow rate of 3000 GPH. Head height, also known as total dynamic head, represents the height water needs to be lifted (static head) plus the friction experienced by the water as it runs through the pipes (dynamic head). Dynamic head is the amount of resistance caused by the plumbing. Water velocity (flow rate), pipe diameter, length and pipe material all play a role in dynamic head. Additional resistance will also be caused by fittings such as elbows and valves. Since this equipment is typically buried in the ground, sometimes an estimation of dynamic head needs to be used. The calculation below is a simple way to estimate the approximate head height. The pond calculator is designed to help you find the pump you need for your project. Be advised that variables outside of this calculator, such as pipe diameter or number of elbows used, can influence proper pump selection. If your pond project exceeds the performance from a single pump, please contact Aquascape Customer Care for additional help.